The Wall Street Journal reported December 26, 2018 that 141 psychiatric hospitals across the U.S. remained fully accredited despite serious safety violations between 2014 and 2015, including the death, abuse or sexual assault of patients. A lot of money is at stake: Medicare payments to inpatient psychiatric facilities reached $4.5 billion in 2017, growing an average of 1% each year since 2006. Evidence repeatedly shows that patients are at risk in for-profit psychiatric facilities that lack effective oversight. The largest U.S. psychiatric hospital chain, owned by Universal Health Services (UHS) has approximately 200 behavioral facilities in the U.S. alone. As of September 2018, UHS had set aside $90 million in reserves to potentially settle a Federal Department of Justice (DOJ) investigation into its billing practices involving 30 behavioral facilities and UHS headquarters. UHS continues to come under scrutiny for patient abuse, yet is allowed to purchase or build more psychiatric hospitals. Another major behavioral hospital chain is owned by Acadia Healthcare, which has 586 mental health and substance abuse facilities nationwide. Both these chains capture billions of dollars in Medicaid and Medicare funding in an overall $220 billion-a-year U.S. behavioral health industry. The potential for fraud in these two chains alone could be upwards of $230 million to $460 million. Over the past decade, UHS has already accounted for about $37 million in False Claims Act settlements and fines. Psychiatric Times estimates that between 10 and 20 percent of state mental health funds are lost to fraud, waste, and excess profits to for-profit managed care companies—representing $5 billion-$10 billion. The National Health Care Anti-Fraud Association (NHCAA) says that individual victims of health care fraud are sadly easy to find. These are people who are exploited and subjected to unnecessary or unsafe medical procedures, or whose medical records are compromised or whose legitimate insurance information is used to submit falsified claims. Many health care fraud investigators believe mental health caregivers, such as psychiatrists and psychologists, have the worst fraud record of all medical disciplines. What is needed is legislation that provides not only more effective oversight but also stronger accountability measures: criminal and civil penalties, removal from Medicare and Medicaid programs and their funding, and hospital closure where systemic abuse is found. Click here for more information about massive psychiatric fraud. This Huffington Post article on April 30, 2015 exposes the fact that poor and foster care kids covered by Medicaid are being prescribed too many dangerous antipsychotic drugs at young ages for far too long — mostly without any medical justification at all. You should read the full Huffington Post article, it is most illuminating. You should also contact your local, state and federal officials and ask them why this Medicaid fraud persists. You heard that right. The idea is to drastically increase the ranks of people on government welfare, crash the welfare system and force it to be replaced by — another government welfare system for everyone. As Cloward and Piven put it, the ultimate objective of this strategy is to wipe out poverty by establishing a guaranteed annual income. In order to precipitate this crisis, the poor must obtain more and more welfare benefits until the system is overloaded. This is just another suppressive way of redistributing income through the federal government. In other words, let’s create a dangerous environment so that people lose their natural inclination to be self-sufficient and hook them on government welfare. “To generate an expressly political movement, cadres of aggressive organizers would have to come from the civil rights movement and the churches, …” Are you starting to see a pattern here with recent riots and demonstrations, largely fomented by people sent in from outside the affected community? Do you know how much “mental health care” and psychiatric drugs are a part of this plot, given that these drugs incite violence and aggression as a “side effect?” Hint — the Missouri Department of Mental Health’s budget is over $1.8 billion per year. Medicaid claims for psychotropic drugs are well over 60 million per year, over 2 million claims per year in Missouri; Medicaid payments for psychotropic drugs are over $6 billion per year, and over $174 million per year in Missouri. Missouri Medicaid (called MO HealthNet) covers 1 out of every 7 Missourians and 38% of Missouri’s children. Roughly 30% of Missouri’s total annual budget goes to Medicaid; but this only covers 50% of Medicaid spending — the other 50% comes from the federal government. 15% of the Medicaid budget goes to pharmacy services; 15% goes to mental health services. And of course the Affordable Care Act allows for the expansion of eligibility for Medicaid — a key part of Cloward-Piven, expanding access to welfare; although at this time Missouri has not yet expanded MO HealthNet eligibility. Psychotropic drugs represent roughly 30% of all pharmaceutical spending, and the cost appears to increase roughly 20% per year. The implementation of the Affordable Care Act is expected to add 2.7 percent, or $7.3 billion, to the level of Mental Health and Substance Abuse spending in 2020, as an expected 25 million people who were previously uninsured gain health insurance coverage. Well, as we looked back on these statistics, we nearly fell off of our soapbox in shock. What to do? Contact your local, state and federal officials and express your alarm. Write a Letter to the Editor. Contact your employer, your school, your church, your family, friends, and associates. Show them a CCHR DVD documentary (we’ll mail you one if you promise to show it around.) Forward this newsletter and suggest they subscribe. Vote! In an August 28, 2013 decision by the United States Court of Appeals for the Seventh Circuit, the appeals judge held that psychiatrists commit Medicaid fraud when they submit Medicaid claims for off-label prescriptions for psychiatric drugs to children for uses that are not approved by the FDA or supported by certain specific pharmaceutical references. Basically, the appeals court reinforced the common-sense position that Medicaid fraud occurs when a doctor submits a Medicaid claim for a prescription written for off-label use, as many psychiatric drugs are prescribed. The original lawsuit, ex rel Watson v. King-Vassel, was brought under PsychRights’ Medicaid Fraud Initiative Against Psychiatric Drugging of Children & Youth by Dr. Toby Watson, a Wisconsin psychologist, to support the Law Project for Psychiatric Rights‘ effort to try and stop the tremendous harm caused by off-label psychiatric drug prescriptions to poor children on Medicaid for uses that have no recognized scientific support. Starting on January 1, 2014, all low-income, non-elderly and non-disabled individuals will be eligible for Medicaid, courtesy of the Affordable Care Act. The Federal Government will provide 100% of the cost of newly eligible people between 2014 and 2016, 95% of the costs in 2017, 94% of the costs in 2018, 93% of the costs in 2019, and 90 percent matching for subsequent years. The bottom line — expanding Medicaid in this manner will also expand Medicaid fraud. Ensuring that psychiatric drugs are available for all citizens, access to Community Mental Health Centers is being emphasized. Need we say that all psychiatric drugs are harmful? Find out why! Report Medicaid fraud in Missouri to Missouri Medicaid Fraud & Compliance. Concerned that psych drugs are being over-prescribed to very young children, the U.S. Department of Health and Human Services (DHHS) is reviewing antipsychotic use in the Medicaid system for children under 18 years old. These drugs include Abilify, which is widely prescribed to children for a range of behavioral symptoms. Other drugs in this category include Risperdal, Seroquel, and Zyprexa. Contact Daniel R. Levinson, Inspector General, U.S. Department of Health and Human Services, at dan.levinson@oig.hhs.gov, and let him know what you think about the psychiatric drugging of children with harmful and addictive antipsychotics. Abilify and other antipsychotic drugs have caused a potentially fatal condition called neuroleptic malignant syndrome. Patients who develop this may have high fevers, muscle rigidity, altered mental status, irregular pulse or blood pressure, rapid heart rate, excessive sweating, and heart arrhythmias (irregularities). Body temperature regulation—disruption of the body’s ability to reduce core body temperature—has been attributed to antipsychotic agents such as Abilify. 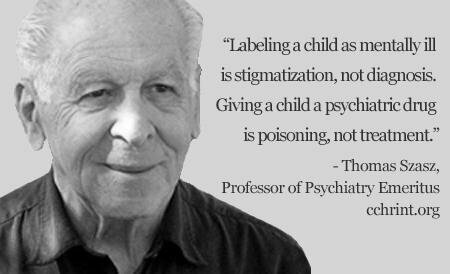 Of course, we recognize that the real problem is that psychiatrists fraudulently diagnose life’s problems as an “illness”, and stigmatize unwanted behavior as “diseases.” Psychiatry’s stigmatizing labels, programs and treatments are harmful junk science; their diagnoses of “mental disorders” are a hoax — unscientific, fraudulent and harmful. All psychiatric treatments, not just psychiatric drugs, are dangerous. It is vital that you, your family, your friends and associates, watch the video documentary “Making A Killing — The Untold Story of Psychotropic Drugging”. Containing more than 175 interviews with lawyers, mental health experts, the families of psychiatric abuse victims and the survivors themselves. This riveting documentary rips the mask off psychotropic drugging and exposes a brutal but well-entrenched money-making machine. The facts are hard to believe, but fatal to ignore. Watch the video online here. Forward this newsletter to everyone you know and recommend that they watch this video. Continuing our discussion of psychiatric fraud (see our recent newsletter on Medicaid), we highly recommend an excellent article on Medicare and Medicaid fraud by Chris Parker in the St. Louis Riverfront Times (RFT) (“Thieves’ Bazaar: Hospitals, doctors and dealers have made Medicare the nation’s sweetest crime”, 4/25/2013). Medicare is a federal government health insurance program for people age 65 or older, people under age 65 with certain disabilities, and people of all ages with end-stage renal disease (permanent kidney failure requiring dialysis or a kidney transplant). Following are some quotes and paraphrases from the RFT article. Since 2007 the federal Health Care Fraud Prevention and Enforcement Action Team (HEAT)Â has charged 1,480 defendants with $4.8 billion in fraud. In 2011 Mohammad Khan, administrator of Houston Riverside General Hospital, confessed to federal fraud investigators for enriching the hospital through a kickback scheme, paying “recruiters” $300 a head to bring Medicare patients to Riverside’s six psychiatric clinics. Then there’s the Las Vegas Cocktail, mixing Xanax, Soma and Vicodin for a powerful opiate high. Michigan’s Monroe Pain Center, near the Toledo, Ohio, border, went from seeing 40 patients a day to as many as 250, prescribing 5 million doses of narcotics over two years, defrauding Medicare out of $5.7 million. New York state centers for people with mental issues were charging the feds $5,000 per day per patient while Arizona only charges $200 a day. New York’s estimated overcharges: $15 billion. Oh, my! Who’s paying for all this fraud? Medicare and Medicaid are government programs, financed by your tax dollars (and the federal debt.) Can anyone guess why health care costs are so high and continuing to rise? What shall we do? What do you think? Has your own health insurance cost increased recently? Shall we just let this fraud continue? These are not purely rhetorical questions. They do have some answers. You are one of the answers. Contact your local, state and federal officials and representatives; let them know what you think about this situation. Suggest that they find out about all the money wasted on fraudulent and abusive psychiatric mental health care, and recommend that they reduce or eliminate the use of harmful, coercive and abusive psychiatric treatments and psychiatric drugs in favor of non-psychiatric alternatives, so that people with mental trauma can actually be helped rather than harmed. Forward this newsletter to your family, friends and associates and tell them to subscribe. More information about psychiatric fraud can be found by clicking here. By the way, report Medicare fraud here.